As with any medical procedure, it is to be expected that questions and concerns may arise about what to expect before, during and after surgery. At Western Bariatric Institute, we believe in putting our patient’s minds at ease. We assure you that there will be plenty of time to ask questions if and when you decide that weight loss surgery is the right choice for you, but in the meantime, we have compiled a few of the most commonly asked questions that we believe are the most helpful in your path to making your decision. Q: Can I get pregnant after weight loss surgery? Q: What about loose skin after weight loss surgery…will I need plastic surgery? A: The amount of loose skin a patient will experience after rapid weight loss is dependent upon several factors: genetics, age, sun exposure, history of smoking, size and shape of your body, and length of time at your starting weight before surgery. Many patients find that after surgery, they feel so good that they do not care about a little loose skin. About one-third of our patients will want to be referred to a plastic surgeon for a consultation to remove some of their loose skin. This procedure is rarely covered by insurance so be prepared to cover it as an out of pocket expense. If you are interested in pursuing plastic surgery, our staff would be happy to refer you to one of the many skilled plastic surgeons in our area. Q: Will I lose my hair after surgery? A: Most weight loss surgery patients will experience a period of increased hair shedding after surgery. For this reason, it is very important to make sure you are getting the recommended amount of daily protein and dietary supplements (vitamins) in your diet. You will need to work very closely with Western Bariatric Institute and attend all of your regularly scheduled follow-up appointments to complete all required lab work in a timely manner. Monitoring lab work on a regular basis can allow your provider to determine if you have any deficiencies that could contribute to hair loss. Keep in mind it is almost always a temporary stage. Q: If I’ve had prior stomach surgery, will I be able to have gastric bypass? A: Prior stomach surgery will not necessarily eliminate you from candidacy for weight loss surgery and for most patients is not a problem. It is rare that patients would have to be converted to an open procedure because of complications from prior stomach surgery, but this is something that you will discuss one-on-one with your surgeon during your consultation and pre-op process. Q: How is the Lap-Band® adjusted? A: The Lap-Band adjustment is a very simple and quick procedure right here in our office during a regularly scheduled follow-up appointment. A special needle is used to access a port that is sutured in to the inner abdominal wall which is connected to your band by some thin tubing. The practitioner will access your port with the special needle and inject saline fluid to fill your band. Q: How long will it take me to go through the pre-operative process and get a surgery date? A: Most patients find that they will be able to complete the pre-operative process quickly and that the time from consultation to a surgery date is generally about 2 – 3 months. This time frame depends heavily on the patient’s motivation and ability to get the checklist items completed to meet the requirements of their specific insurance company. Some insurance companies may add 6 – 9 additional months to this time frame based upon their pre-authorization requirements. Q: Do I have to do a special diet before surgery? A: Yes, our surgeons require that you lose 10% of your excess body weight (different from your total weight) prior to surgery and we will assist you in this effort by putting you on a specific pre-operative diet. It is called the Step-by-Step Pre-Operative Diet and may range from 4 – 8 weeks or longer for some patients. This diet will be provided in detail after you complete the Steps to Success Class. Q: How often do I come in for appointments after surgery? 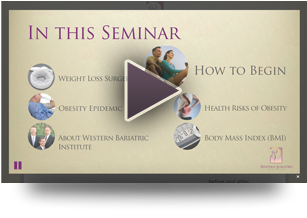 A: Western Bariatric Institute wants to partner with you for the rest of your life! 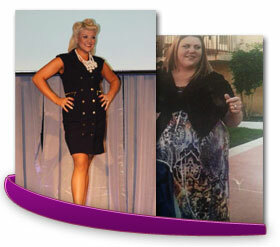 This partnership will assist you with meeting your weight loss goals and maintaining optimal health. For our bypass patients, you will need to be seen in our office one week following surgery, at about 3- 4 weeks, 3 months, 6 months, 9 months, one year, and then once per year intervals, forever! If you decide to have gastric banding surgery, then you will need to be seen at one week following surgery, 6 weeks, and then every 4-8 weeks as needed for a band adjustment. After you are adjusted to the perfect spot, you should follow up every 6-12 months, or if you have changing symptoms, such as, pain, vomiting, acid reflux, or other concerns. Our goal is to set you up for success no matter what path you choose, use as a resource! Q: How long will I be out of work after surgery? A: Most patients will only need to take 1-2 weeks off of work after surgery. Many of our patients even return to work after a few days! You will work closely with your surgeon to discuss you particular needs. A: Your surgeon will want to get you up and walking the very day of surgery. They will also want you to walk as much as possible, each day increasing your walking time little by little. Most patients can resume a normal workout routine within 1-2 weeks following surgery. Q: How much does surgery cost? A: Your surgery cost will depend on how your insurance is contracted with WBI and with your preferred facility. Costs include surgical fees, facility and anesthesia fees. Some additional costs include bariatric meal replacements, food, medications, and additional diagnostic tests or labs as necessary. Please consult with your patient advocate to determine your total cost. Q: What if I’m just under the criteria for the BMI and medical necessity? A: Most insurance plans are VERY strict on the requirements that need to be met in order to be approved for weight loss surgery. They will require you to at least have a BMI of 35 or higher with 1-2 co-morbid conditions that you can document or a BMI of 40 of higher. Unfortunately, they do not make exceptions for patients that are being treated for co-morbid conditions if they do not meet the 35 BMI requirement. If your BMI is below 35, weight loss surgery may still be an option for you as a self-pay patient. For more information, please contact us. Q: What about medication? Can I still take pills or do they have to be liquid/chewable? A: Most of your medications following surgery will need to either be chew-able, crushable or in liquid form. You will need to work closely with your primary care physician and your pharmacist to find forms that work for you. The good news is that most patients find that they take much less medication after surgery once they start losing weight. Remember: Not all pills should be crushed, so it is very important to consult your pharmacist if your medication label states “do not crush or chew”. Q: Can I use whatever shake mix is cheapest? A: There are a number of shake mixes on the market. Not all are created equal. It is important to know what you are buying. Some products are protein supplements, and do not have a balance of ingredients. Protein supplements are not meal replacements, so these products are not acceptable for your pre op liquid diet (Step Diet). Some protein supplements are not made with quality protein and therefore, although inexpensive, may not provide all the necessary protein your body needs after surgery. You need to read labels, and look for the word “isolate”. If you find soy or whey isolate listed as the ingredient, then the protein should be acceptable. If you find “proprietary blend” this type of protein in not necessarily good quality and should be avoided. If you have questions on a shake mix feel free to ask our staff for help.